Aaron Graffin was carried off early on with a serious looking leg injury as Antrim lost 1-21 to 0-7 to Westmeath in the Leinster SHC at Cusack Park. 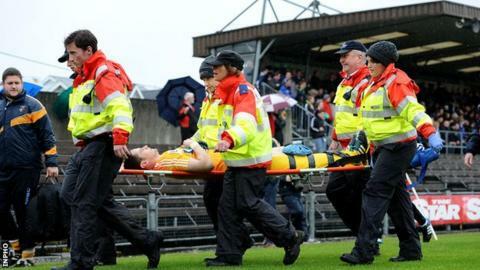 Graffin was stretchered off after play was delayed for 10 minutes to allow him to receive treatment on the pitch. The hosts were dominant throughout and a 34th-minute Alan Devine goal helped them to a 1-13 to 0-2 half-time lead. Westmeath extended their lead and dealt a major blow to any hopes the Saffrons had of reaching the quarter-finals. A defeat by Carlow in their next fixture could condemn Kevin Ryan's side to the Christy Ring Cup next year, just weeks after their relegation to Division 2A. The Saffrons' performance at Mullingar was in marked contrast to the morale-boosting display they produced in defeating Laois in the first of their round-robin qualifying group game last week. The winner of the four-team round robin series group will face Offaly in the Leinster quarter-finals with the second-placed team playing Wexford. Whoever finishes bottom of the round robin series faces a play-off against the Christy Ring Cup winners for the right to play in the Liam McCarthy Cup next year. Niall O'Brien displayed his class with five points in the opening half, with the Saffron points coming from Paul Shiels and Eoghan Campbell. Ciaran Clarke, Shiels and substitute Ciaran Johnson were on target for the Ulster men, but they came a poor second on a forgettable day. Westmeath continued to perform with poise and purpose, adding further scores through Derek McNichols, who nailed a sublime sideline cut, O'Brien, who finished with an eight points tally, and Devine. Antrim must defeat Carlow in their next game to have any chance of advancing in the series. Westmeath: S McGovern,S Power, T Doyle, G Greville, A Craig, A Clarke, A McGrath, E Price, C Boyle (0-2), N O'Brien (0-8, 5 frees), D McNicholas (0-3, 1 s/l), R Greville (0-4), A Devine (1-3), B Murtagh (0-1), D Clinton. Subs: E Corrigan for Clinton, J Clarke for McGrath, J Boyle for McNicholas, L Varley for G Greville, M Daly for Murtagh. Antrim: C O'Connell, O McFadden, J Dillon, P Shiels (0-2, 1 free), S McCrory, C McKinley, A Graffin, M Bradley, N McAuley, R McCambridge, N McManus, E Campbell (0-1), C Clarke (0-2, 2 frees), Conor Johnson, D McClean. Subs: D McKernan for Graffin, C Carson for McClean, Ciaran Johnson (0-2) for Campbell, T McCann for McManus, M Donnelly for Clarke.